Specific body cream for slimming, reducing localised or general fat deposits, balancing and aiding digestion. ADIPO GASTA counteracts the excessive craving for sugars and saturated fats in the diet. Sugars and fats (meat, chips, fried foods...) are totally indigestible and saturate the liver and gall blader. If food is not properly digested, it is difficult for the essential elements to synthesize, resulting in endocrinal imbalance (especially thyroid and cortico-suprarenal) permitting an abnormal accumulation and retention of local or general fat. A biological extract, supplying all nutrients. A biological base, containing glucidamines supplying mucopolysaccharides and hyaluronic acid. After application of the lotion Lympho and, if necessary, the phial Veinulo (depending on the problems with visible capillaries) and the cream Vasco Artera (to aid penetration), a small quantity of ADIPO GASTA should be lightly massaged into the soles of the feet, the ankles, calves, thighs, hips, buttocks, abdomen and waist, especially on the most noticeable fat deposits. The cream ADIPO GASTA should penetrate easily and leave no traces on the skin to allow immediate dressing without discomfort. In case of excessive general or localised fat deposits (outer thighs, abdomen...) it must be applied mornings and evenings. 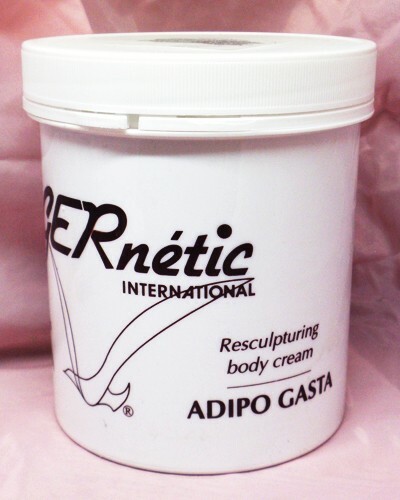 The cream ADIPO GASTA is a very complex product of unprecedented quality, giving rapid and lasting results.